Crafted in 1922 for our original church building (now the Parish House), the Church's first organ, a two-manual Austin, was moved into the new Sanctuary when it was built in 1951. The Austin Company has been making organs since 1893. The Church hired Austin again in 1958 to build and install a new three-manual organ console, at a cost of about $5,750. After nearly 20 years of intensive use, it became necessary to replace that organ -- all that could be salvaged was the electric blower. 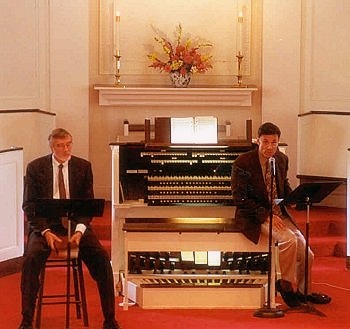 The organ breathed its last at Christmas Eve service in 1974, beginning a period of study, planning, fund-raising and a cappella choir singing, all overseen by Minister of Music Emeritus John Schuder (pictured below, on the right). Thanks to extraordinary fund-raising efforts by a committed team of congregants, a new three-manual Austin pipe organ was installed in 1975. It boasts 2,038 pipes ranging in size from 3/8 of an inch (and as thin as a soda straw) to 16 feet (with a 12-inch diameter), along with a pedalboard and 37 stops. The pipes are arranged in 36 families of pipes (known as "ranks"), alike in form and material, decreasing in size as the pitch goes higher. Operational controls include 20 couplers, 51 manual pistons, and 21 toe positions. There are additional controls for a 21-note set of chimes, retained from the previous instrument, and for a new Cymbelstern designed originally for German Baroque instruments and consisting of four bells of different pitches which ring alternatively when struck by a wind-pressured, rotating hammer. Cost of this new organ was approximately $100,000.